SkyWire Serial Accessory - Now with Lightning! Simulation Curriculum now offers two wired telescope-control solutions for your Apple mobile device: SkyWire and SkyWire Lightning. 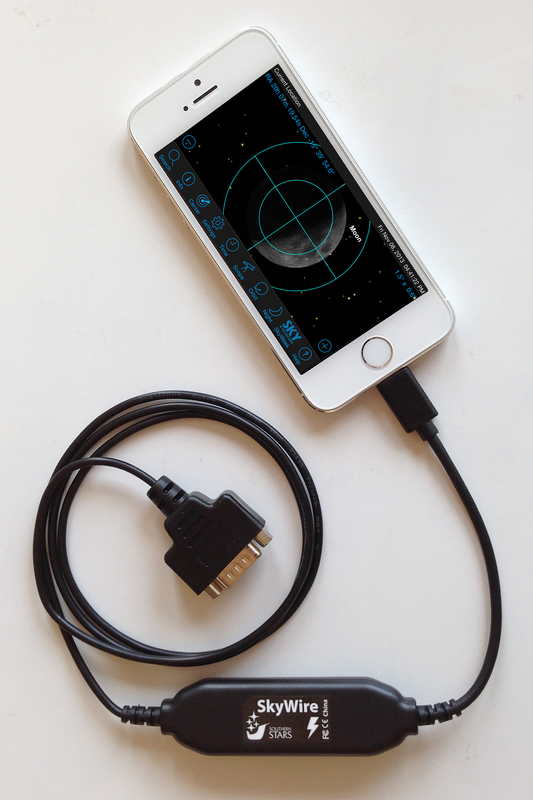 It's the simplest way to turn your iPhone into a 21st-century telescope controller. 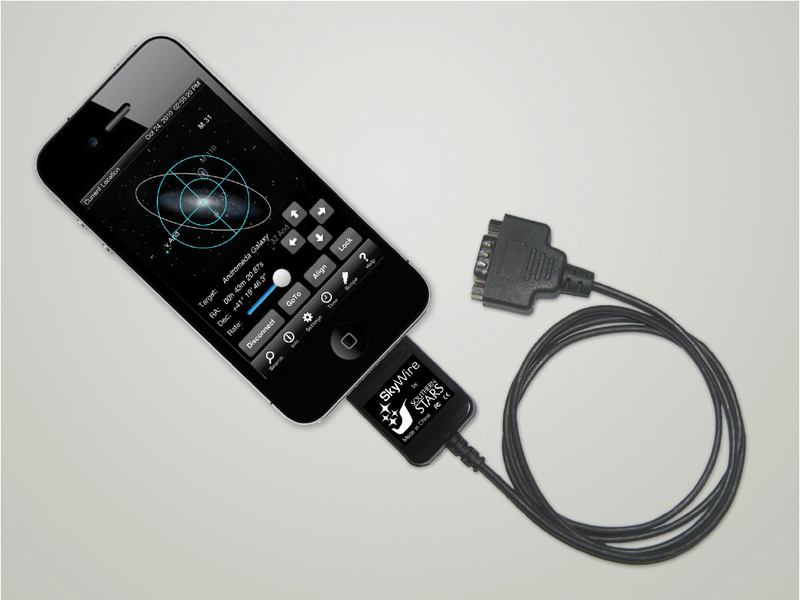 This brand-new "Made for iPod" accessory adds an RS-232 port to your iPhone, iPad, or iPod Touch - and lets it connect directly to the serial port on your telescope. Left: SkyWire Lightning accessory connected to an iPhone 5S running SkySafari Pro. Click to enlarge. Both versions of SkyWire are available in black only. Above: SkyWire accessory connected to an iPhone 4 running SkySafari Plus. Click to enlarge. On shipping SkyWires, the sticker is on the back side of the connector! Most telescope models will require an additional cable to adapt SkyWire's standard DB9 connector to a telescope-specific RJ-11 serial connector. If you already have a "PC serial cable" for your telescope, you don't need this additional cable from us. If you do need this cable, we can provide one for you - with free shipping if you order it with SkyWire! The original SkyWire will also work with newer Lightning iOS devices through Apple's Lightning-to-30-pin Adapter or Cable. SkyWire may also work with other third-party Lightning-to-30-pin adapters and cables, but we've only tested SkyWire with genuine Apple accessories.